As coordinator of Cats’ Cupboard, I want to provide you with some happy news and exciting updates. We have been very busy here, serving students, raising awareness, providing students and staff/faculty with resource referrals, and exploring ways to combat stigma. As we move into the spring, we have some new things on the horizon to share! Attached you will find a “Visitor Report” for our first semester of operation. 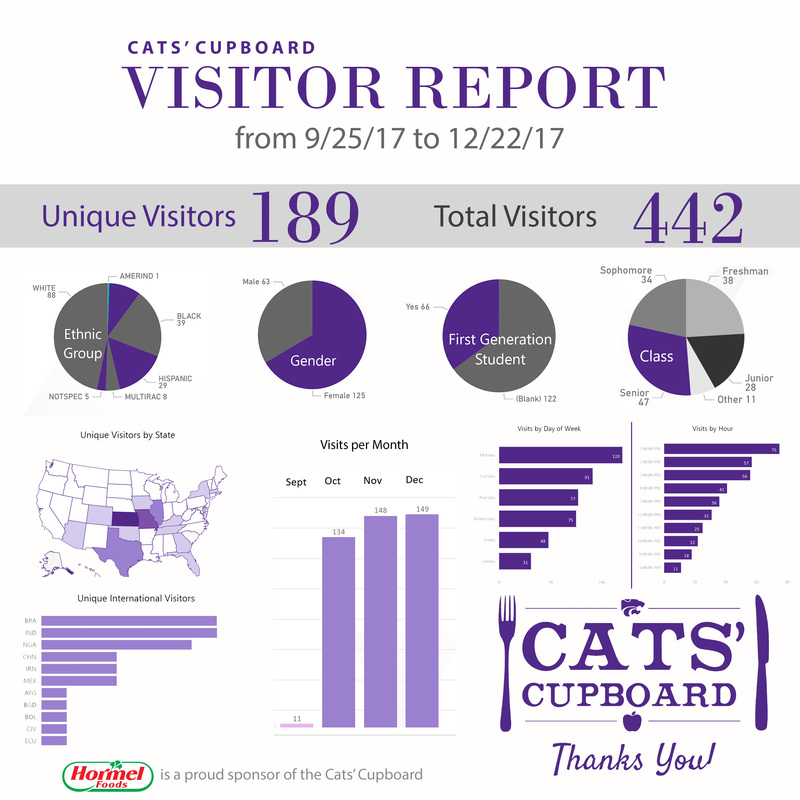 From September 25 to December 22, we had 189 first time visitors using the pantry, and a total of 442 visits for those three months. Our students came from every college on campus, with the largest majority being in-state students. 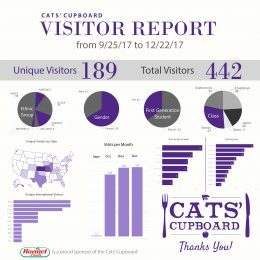 My quick math shows we have now had close to 230 unique victors with well over 590 visits to the pantry. The second part of that sheet shows preferred usage times for students. This is helpful as we move forward in evaluating our current policies and procedures. Another exciting update is that we have hired an undergraduate employee for 10 hours per week. Maureen has served as a volunteer for Cats’ Cupboard since we opened our doors. Maureen is a senior in Dietetics and Cats’ Cupboard has been a big resume boost as she applies for graduate programs and internships. Maureen has been working on a newsletter, and we hope to have something monthly to share on our website and interested stakeholders. Please be on the lookout for that! Speaking of volunteers, we have 17 dedicated front desk volunteer staff and four marketing and communication student volunteers; and countless students donating their time, energy, and resources to share with their fellow classmates. It is truly inspiring. 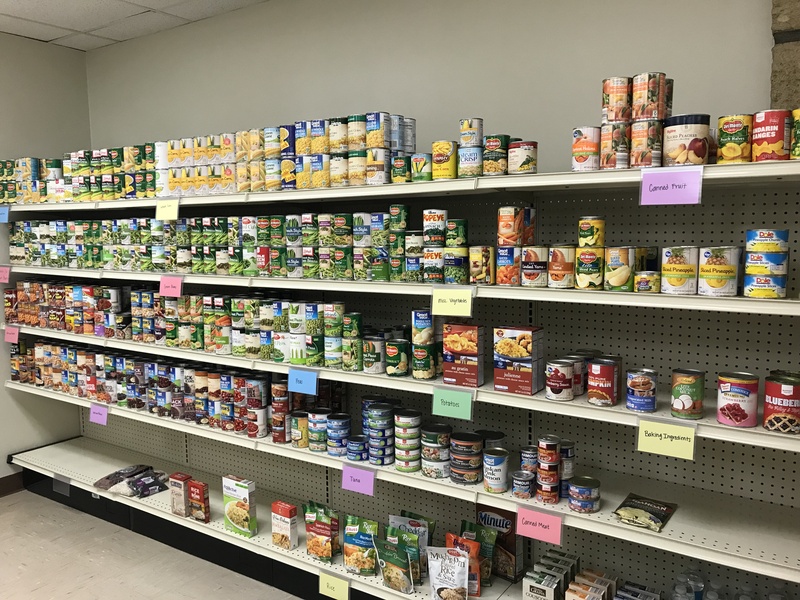 At last count, we were well over 300 hours of volunteer service hours just within the pantry walls since October! We would like to give a big shout out to Hormel Foods who has shared very generous donations with Cats’ Cupboard. Hormel Foods was on campus last Fall with the K-State Foundation when they came across a sidewalk chalk message written by a volunteer. They decided to give both monetary and product donations to Cats’ Cupboard. Since this partnership, they have given $5,000 to our Foundation account and have sent us food. The items include Skippy peanut butter, SPAM, Compleats, Chi-Chis tortilla chips and shells, Hormel chili, and Muscle Milk bars. These items have been very popular among students as they are quality food items and are quick and convenient sources of protein. Attached you will find a thank you poster a marketing volunteer, Jael, created for us to express gratitude in the pantry. We have had countless other donations from across campus, the community, and the state! Attached you will also find a thank you post card we sent out to material and financial donors, also created by Jael. 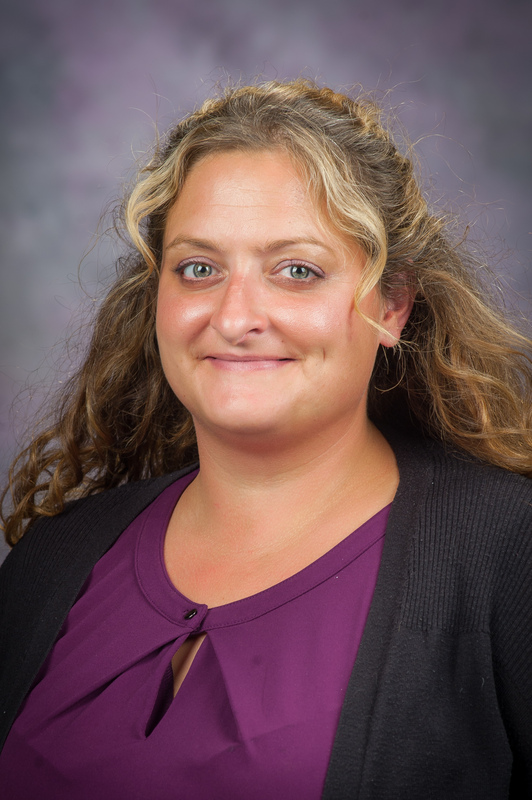 As we look to the future, some of our upcoming plans are to partner with Housing and Dining Dietician, Missy Scharder, to host a residence halls cooking class utilizing pantry items. Our goal is to spread awareness that we are here for all students in need, equip students with skills once they move into the community, and provide nutritious recipes that can be made with minimal equipment. We are working with DCM to create a video to visually represent what 40% of financially stressed students look like in a classroom, a cup of Radina’s coffee, the Pride of Wildcat Land Marching Band, and other K-State specific symbols. We are partnering with Kansas Appleseed to host a hunger forum to amplify the conversation on campus about food insecurity and college students. 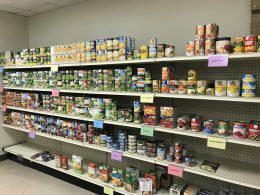 I often get asked what items we are most in need of so I thought I would conclude this update with a few things that fly off our shelves as soon as we get them in: Canned fruit, spaghetti sauce, cereal, granola bars and other quick/healthy snacks, canned meats, especially chicken, jelly, pancake mix and pancake syrup, gluten free pastas, feminine pads and regular sized tampons, deodorant, dish soap, toilet paper, crock pots, and microwaves. We are excited as we move into the Spring for having a bigger impact on students!